Honeycomb bongs are a perfect way to get a super smooth and clean drag. The tiny holes designed to look like honeycombs are meant to filter resin and any other substance that may affect your throat and ruin a perfect smoking session. Apart from getting you a one-of-a-kind smoking experience, these units are beautifully designed. Below are some of the best honeycomb bongs you’ll find on the market today. The Black leaf bong is spectacular and sleek. The design features three honeycomb discs that are aligned evenly on the glass tube. 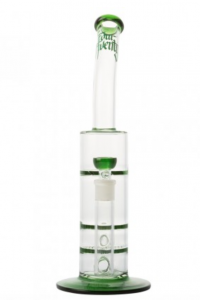 The glass bong is fitted with percolators that filter out the smoke to ensure your puff is as smooth and silky as can be. The product has a triple filtration system. This enhances the flavor while ensuring the smoke does not harm your lungs or irritate your throat. The Black leaf honeycomb bong also comes with a blue handle to ensure that you keep your hands safe while carrying or lifting it around. The base of the comb is flat and round to ensure stability with a matching blue rim at the bottom. This bong is 25.5cm long with a 4.0mm thickness of the glass. 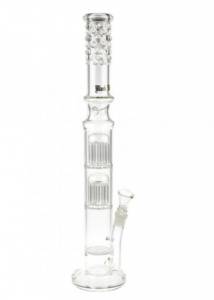 The Ice bong honeycomb’s distinctive feature is the 10 arm percolators. The best part is you get two 10 arm percolators in this product. These make the smoke extra smooth and rich. This Ice bong also has a diffuser disk for the cooling of smoke. It also helps to remove impurities and other pollutants. The diffuser is fitted at the bottom of the tube. There is also a built-in downstem in this ice bong. To make the deal even sweeter, the Ice bong has a few ice notches to allow you hold ice cubes for that extra cool smoke. The percolating machine is clear in color, with beautiful glass beads. If you are looking for a cool smoking experience, this is definitely the honeycomb bong for you. 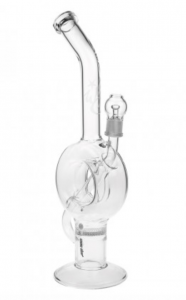 The Four twenty glass ice bong comes with a double disc and a tornado disc. It has heat-resistant borosilicate glass which makes it easier to handle. The two-disc diffusers ensure that all smoke pollutants are practically nonexistent by the time the smoke hits your mouth. The tornado disc helps to spin the water and cool the smoke to give you that silky cool finish. The bong also has an in-built downstem with a glass side bowl 18mm in size. These mean machine can hold ice cubes on the ice notches to make the cool effect even more intense. The Four twenty ice bong has a clear handle for easy handling with a matching flat bottom to ensure stability. It is decorated with green accents adding a herby feel to the bong. This product features a built-in reinforced downstem. 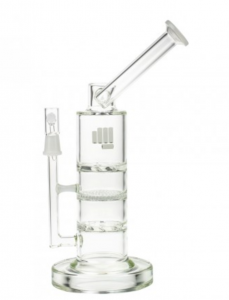 The glass thickness is 5.0mm, while the height of the honeycomb bong is 40cm long. This stunning honeycomb bong is the Black leaf brand. It is fitted with a twister which amplifies the swirling effect of smoking. The twister is the star feature in this product. The bong is specifically made for herb smoking. It also comes with a percolator which grinds up the herbs and produces smooth smoke that is free of particles. The percolator cools down the smoke while retaining the flavor, delivering it with a silky punch. The honeycomb bong is made only the best quality of borosilicate glass and it comes with a matching borosilicate glass bowl for the herbs. The Black leaf twister bong comes decorated with black accents around it. This exquisite bong is from Snoop Dog’s line that has a selection of dry herb bongs. The celebrity is a self-proclaimed lover of smoking making him knowledgeable enough to have his own bongs line. 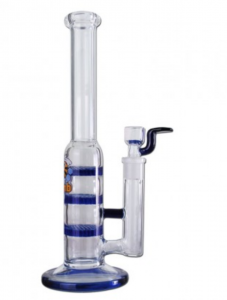 This is an all in one percolator bong, meaning it is multifunctional and multipurpose. One can smoke both dry herbs and waxy concentrates as well. It comes with a built-in downstream. He has a range of accessories that come with this package. These are a quartz concentrate bucket, a glass ponds dab tool, a glass concentrate nail, a vapor dome, and a herb bowl. That’s not it though; this bong comes with a triple filtration system that helps sift the impurities, leaving only pure smoke packed with flavor. Two percolators are fitted in the Battleship bong too for the smooth crushing of the particles which gives comfort to the lungs and the throat. It is made of high-quality heat-resistant borosilicate glass to top it all off. The Ring of Fire Bong by Ws is intricately designed to meet the needs of a smoker. Everything is put into consideration and you can almost feel that the manufacturer had your needs in mind. It comes with a disc percolator that helps to break down particles for that smooth finish. This is also a multipurpose bong which can be used to smoke dry herbs and to vape oils. For this purpose, the bong has an extra slide attachment. The disc also comes with a glass concentrate nail and a herb bowl. 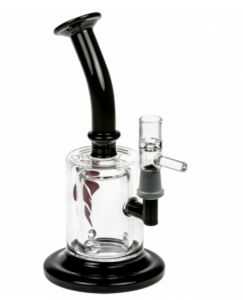 The bong is made of high-quality borosilicate thick glass. The bong is 42cm in height. Ziggi Jackson who is the designer of this bong is from Germany hence the engraved word Germany at the bottom accompanied by his signature. Designer bongs definitely cost more than regular bongs; nonetheless one can still get a good bong for the standard price point.